Born in Meeker, CO, Kenneth Sanderson (1898-1973) came to California with a Wild West show in 1914. Early work as a movie stuntman in William S. Hart’s “Hells Hinges” (‘16) and others was interrupted by service in WWI. 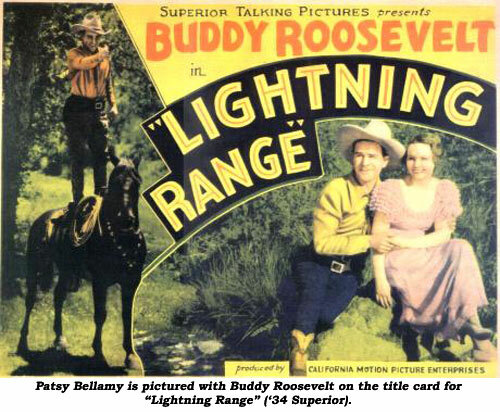 Returning to film work after the Amistice and renamed Buddy Roosevelt by independent producer Lester F. Scott Jr., he starred in a fast action group of some 25 silents from 1924-1927. Another group of starring silents for Rayart followed in ‘28-‘29. 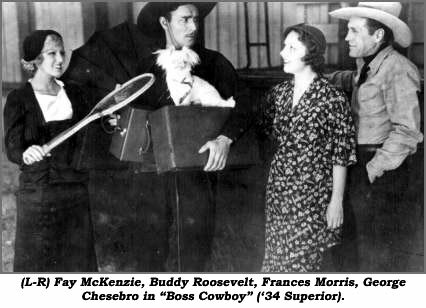 As sound came in, Roosevelt got a big break when he was chosen to star as the Cisco Kid for the all-talking "In Old Arizona" (‘29), but had to withdraw at the last moment due to a broken leg. Warner Baxter replaced him and won an Academy Award. 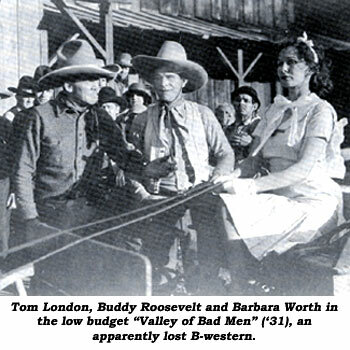 More misfortune plagued Buddy after producer Paul Malvern had decided on Roosevelt for a new series of sound westerns. Buddy's wife ticked off Malvern by demanding too much money so the producer hired John Wayne instead and, the rest, as they say, is history. 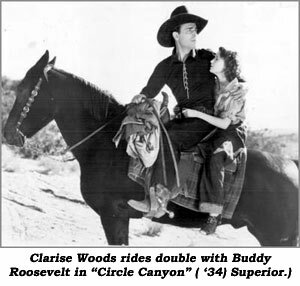 Relegated to the bottom of the barrel B-westerns, Buddy took what was offered by ultra low-budget producer Jack Irwin. Three films were produced in ‘31 all of which now seem lost to the ages. 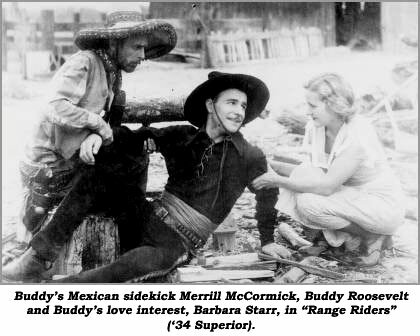 In ‘32-‘33 Buddy turned to supporting roles in films with Tom Mix, Buck Jones and others. His last starring series of four was for Victor Adamson, released by Superior Talking Pictures in ‘34, They did nothing to further his career, the rest of which was all support work through the early ‘60s. LIGHTNIN’ SMITH’S RETURN (‘31 Jack Irwin Prod./Syndicate) Not available for viewing. THE RIDIN’ KID (‘31 Jack Irwin Prod.) Not available for viewing. VALLEY OF BAD MEN (‘31 Jack Irwin Prod.) Not available for viewing. Shifty George Chesebro, ranch foreman for Sam Pierce and his just returned sister Frances Morris, is making advances on her and rustling cattle of nearby rancher Lafe McKee who has a just back from the East daughter, Fay McKenzie, who is fond of Lafe’s foreman, Buddy Roosevelt. Got it? It’s really not worth it—just a lot of bottom-rung-budget milling around directed by inept Victor Adamson. This one’s so low budget—someone forgot to notice toward the end that Buddy had been sporting a mustache for the rest of the film. It suddenly disappears—then reappears in the last shot! A brief burst of some interesting desert action in the last 10 min. and George Chesebro’s always fun to watch hammy chew-up-all-the-scenery save this no-budgeter from the can. Muddy, confusing relationships in a lame, tedious Victor Adamson produced and directed affair. Buddy Roosevelt and his adopted daughter, Clarise Woods, are pursued by outlaws. The outlaws’ motivations for pursuing Woods are never satisfactorily explained. The rest is a mish-mash of real fathers, aunts, robber-nephews, old friends—you’re better off to watch the year later remake “‘Neath the Arizona Skies” with John Wayne which makes much more sense. LIGHTNING RANGE (‘34 Superior) Deputy U.S. 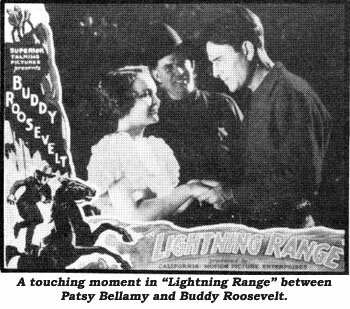 Marshal Buddy Roosevelt, tracking Olin Francis and his gang, stumbles into a wedding scheme and ends up marrying the girl himself. Remake of Buddy’s own “Galloping Jinx” (‘25). As lowbudget and as full of plot potholes as producer/director Victor Adamson’s films are, there’s an inherent sense of fun about them. This one features some marvelous and action-packed stuntwork. 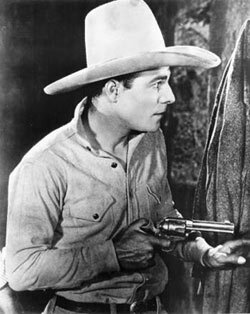 With his town plagued by a gang of toughs led by broken-nosed Lew Meehan, rancher Horace Carpenter sends for his son whom he calls “a Texas terror”, Buddy Roosevelt, who arrives to rout the bullies masquerading as a milquetoast easterner (very much resembling comedian Charlie Chase) then switches to a gay caballero. Not exactly great western filmmaking from director Victor Adamson, but it’s certainly never boring with its constant movement. Benefits greatly from the excellent photography of Byron Baker and snappy editing of Frances Burroughs.